Today around the world people will demonstrate, write blog posts, think and talk about the issues surrounding water. Lack of water, the polluting of it, bottling it, public water ways sold for profit. Indeed there is a lot of interest in the water in our own backyards. As another World Water Day arrives the time has never been better to consider the state of water, in our taps and around the world. In Canada we are flanked by two Oceans and have the most fresh water, and best drinking water in the world. We also have a pressing need to protect this natural resource that is our heritage and human right. The Council of Canadians, a group of citizens that supports social action, urges Canadians to protect the water that belongs to all of us. They have issued an action alert a call out to British Coloumbians to take notice of the governments plans to modernise the water act. Alarming propositions like the introduction of a Water Market that would deregulate controls over who uses the water and for what. Removing any prioritising of water for the people of this province. This is our natural resource. How it will be managed, and who, if anyone, should profit from the use of it needs to be determined. There is a world water forum being held in Brussels, and also currently under negotiation is a trade agreement, much like NAFTA, with the EU that would givve access to the rivers of B.C. as part of the deal as well. Who should have access to this water? If it is a human right we can not keep it all for ourselves, but surely we realise the absolute need to protect our own access to this water. The water in British Columbia belongs to the people, animals and plants who live here. It is ours and not for sale to the highest bidder. Protecting this resources is our responsibility. Any government or individuals who would stand to profit from this process does not act in the best interest of it’s citizens. *A provincial Water Act was introduced in 2012. Tell the BC government that you do not want the introduction of a water market to allocate water under the new Water Act. Ask the government to support an allocation system that provides hierarchy of use prioritizing ecological and social needs. 1) Though the ability for resident’s to engage has be significantly limited in recent months you are able to engage with the process by posting to the ‘Living Water Smart’ blog: (http://blog.gov.bc.ca/livingwatersmart/) or email ian.graeme@gov.bc.ca. 2) With the political uncertainty surrounding this process, it is extremely important to raise this issue during the leadership races of all the political parties and to demand that candidates make a commitment to preventing a water market from being introduced in any future legislation. Contact your local MLA today and make sure that all leadership candidates make their position clear. *From the Council of Canadians Website. Water Fracking – is it harmful? 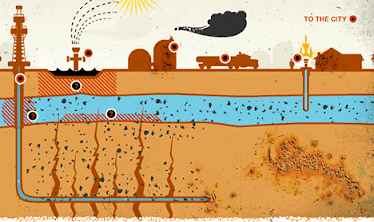 Just What is Hydraulic Fracturing? The website is filled with information about this questionable practice that has reached epic proportions throughout the United States, and now Canada. With alarming statistic like over 80 000 pounds of chemicals are injected into the earth’s crust to “Frack” each well, the majority of which are toxic VOCs that contaminate the water table and air in the process of extraction. Much controversy has arisen from this movie, the powerful Gas lobby and industry has replied with a “truth” campaign designed to discredit the director and the undeniable facts that this process is harmful, and largely unregulated. The reply from the film-maker also goes to great lengths to substantiate his claims. The magazine The Environmental Leader Recounts the New York Times article questioning the safety of the water fracking industry. For a Canadian perspective Fracking Canada informs of the dangers of the practice. It also seeks to encourage a dialogue about a subject that is not well known, except to the people who live with the reality of the wells and waste water in their backyards. This is an important topic to learn more about. We need to question whose interest is being served in the process of this resource extraction. Fast forward to my twenties; I made the pilgrimage from central Canada to the West Coast. I started spending time up at my father’s vacation property, miles away from any town, deep in the mountains surrounded by Ponderosa pines, wild streams, and rugged beauty. It was here I first learned the true value of water. Years ago at my father’s property there was no well dug yet. We trucked in all the water we would consume ourselves. Lucky to have a stream at the very edge of his acreage, we would hike down to it for water to boil to wash dishes. This gave me some small insight into what it means to have water at the tap; the convenience I had taken for granted for twenty years was never more clear to me then. If you have never been lucky enough to experience camping in the wild, it may be hard to comprehend my experience. Here in north America we have an abundance of water, in Canada particularly, with the most fresh water in the world, it can be hard for the average city dweller to relate to a lack of water. Today there is World Water Day - World Ocean day, and World Rivers Day to remind us of the issues and very real threats that our water supply faces. You don’t have to look far, watering restrictions, water contamination, and bottled water are all hot topics for the blogisphere and beyond. When the statistic I read in the April 2010 National Geographic related that EVERY YEAR, U.S. SWIMMING POOLS LOSE 150 BILLION GALLONS OF WATER TO EVAPORATION, one has to wonder if everyone has forgotten the value of water. After heavy irrigation some progress has been made the world over to improve the availability of water for drinking and farming. There are still millions of people around the world who do not have access to clean water or proper sanitation. The divergence of this water has caused many problems as well, damming natural streams, piping water, sometimes miles into dense cities is not effective, the longest water tunnel supplying New York City at 85 miles, loses 35 million gallons of water a day, we can not say this is effective. In California irrigation enables farmers to grow half of all the fruit, vegetables and nuts in the United States, while at the same time creating a dust bowl where fresh water used to flow. Water Aid is an organisation that’s focus is to improve access to fresh water and sanitation for the poorest nations on earth. Still there are people, usually woman and girls, who spend hours a day fetching water, usually contaminated , just to survive. The United Nations has stated that access to clean water is a human right. Our bodies are made up of 60% water, it is the most valuable element on earth. Water conservation and stewardship is one place to start. There are many things we can do to improve on this statistic. From using more effective shower heads, tap aerators and modern toilets, even water displacement in toilets can save huge amounts of water. Rain water collections, reusing grey water – watering plants with dish water for example. Watering by hand instead of using a sprinkler; take short showers, keep water in the refrigerator instead of letting it run to get cold. All these measures can make a difference. One thing everyone can do is inform themselves about the issues and make better choices to conserve and become better stewards of the water. Will the next world war be fought over water?The concept seems preposterous to me. I think living Canada, a nation with the most fresh water in the world it is difficult to relate to water shortages. March 11th was water bottle free day . Most of the people know about the dangers of plastic water bottles and the exuberantly high cost of bottled water, is still lost on some people. In the lower mainland of British Columbia, where I live, the water is abundant and is considered by many to be the finest drinking water in the world! When I talk about water with my family back east, in Ontario specifically, they do not hear me. They are all still reeling from a news story from years ago. Mention the word “Walkerton” to any Ontario resident and images of water contamination and death come to mind. No less then seven people died and hundreds were sickened by water that was contaminated with E coli. Since that spring in the year 2000, measures have been taken to ensure that a tragedy of this magnitude never happens again. It was determined that human error and carelessness lead to the contamination. This terrible event also lead to another great travesty. People think that bottled water is safer than tap water! The truth is that many of the bottled water companies bottle tap water! Sure some of the water has been filtered, but many people now filter their tap water at home, like us, we use Wa2. Our water is safe enough to drink from the tap as it is. We use a filter because the tap water in our city has chlorine and this filter helps reduce the taste. Successfully decreases our dependence on polycarbonate. Polycarbonate, the main ingredient in your five gallon water jugs, is not biodegradable. Dramatically reduces the number of bottle caps produced. Bottle caps are not reusable, nor are they biodegradable. Significantly reduces air pollutants, roadway congestion, and fuel consumption created by bottled water deliveries. WA-2! supports the environment by using fuel efficient vehicles and encouraging paperless billing. Many municipalities around B.C are taking the issue to the masses by banning bottled water! No more bottles of water at city hall meetings, no more bottled water in schools and community centres, forcing people to question the safety of bottled water and bringing back the water fountain. Water is a basic necessity for life. When I was growing up the term “acid rain” was thrown around like a Frisbee, today we know that we need to protect our national resource and education is the starting point.